Pennsylvania’s new medical marijuana statute has taken effect, and dispensaries are open. The law contains a specific caveat barring employers from “discriminating” against employees who use medical marijuana with a legal state certificate. Pennsylvania employers will now join others in a growing number of states learning how to handle employees who test positive for medical marijuana. In April 2016, Governor Tom Wolf signed the Pennsylvania Medical Marijuana Act (PMMA) into law. In February 2018, the state opened its first medical marijuana dispensaries. Pennsylvania now joins more than half the states in the country in legalizing marijuana for medical purposes. The Act created the Pennsylvania Medical Marijuana Program, which legalizes medical marijuana for patients with one of 17 defined “serious medical conditions” who obtain a legal certificate. Of particular note to Pennsylvania employers are the Act’s sections that specifically forbid them from discriminating against or taking adverse employment action against employees with proper certification for their use of medical marijuana. The law states that “no employer may discharge, threaten, refuse to hire or otherwise discriminate or retaliate against an employee . . . solely on the basis” of his use of medical marijuana with a valid state certificate. This is limited in scope, however. The Act clearly states that no employer is required to permit any employee to either use or be under the influence of marijuana while on duty or on company property. Pennsylvania employers are now lunging headfirst into the uncertain territories of marijuana law and federalism. Regardless of the laws of the various states, marijuana remains illegal federally under the Controlled Substances Act (CSA), and anyone using marijuana—medical or otherwise—is a current illegal drug user who isn’t entitled to a reasonable accommodation under the Americans with Disabilities Act (ADA). As of yet, no federal court has forced an employer to accommodate the use of a drug that remains illegal under federal law in violation of the ADA. However, two recent decisions—one from Massachusetts and one from Connecticut—have cast doubt on whether reliance on federal law under the ADA is sufficient to dismiss a state law discrimination claim for disciplining an employee for using medical marijuana. Employers cannot simply rely on violation of the company’s drug policy to support a termination when a valid prescription for medical marijuana is at issue. Barbuto was a particularly interesting decision because the use of medical marijuana wasn’t included in the state’s discrimination law. On the heels of Barbuto, the U.S. District Court for the District of Connecticut issued its decision in Noffsinger v. SSC Niantic Operating Company, becoming the first federal court to rule that federal law doesn’t preempt a state law that expressly prohibits employers from firing or refusing to hire someone who uses marijuana for medical purposes. In Noffsinger, an employee was given a conditional job offer as a recreational therapist, but the day before her scheduled start date, her offer was rescinded after she tested positive for medical marijuana. In denying the employer’s request to dismiss, the federal court ruled that the state statute authorizing the use of medical marijuana wasn’t preempted by the three federal statutes that generally appear front and center in these cases—the CSA, the ADA, and the Food, Drug and Cosmetics Act. What these cases illustrate is a shift in the trend that we had been seeing where federal law and policy language are key to excluding employees from employment based on the federal ban on marijuana use. That may not be the case moving forward. 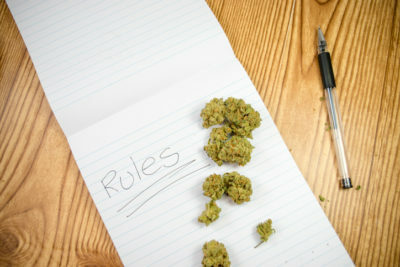 Pennsylvania joins Arizona, Connecticut, Delaware, Minnesota, and others in explicitly placing language in their statutes that require employers to accommodate legal marijuana consumption that doesn’t negatively affect job performance. The PMMA contains the type of explicit carveout that the Connecticut court found shielded employees from discipline based on medical marijuana use. You should update existing drug policies and employee handbooks to specify that testing positive for drugs that are illegal under federal law, including marijuana, violates the policy. When the test is positive for marijuana, your policy should state that you maintain the right to discipline and/or terminate. However, you should also engage in the interactive process with employees who have medical marijuana certifications to ensure that they are complying with the Act, are not under the influence at work, can safely perform their duties, and can perform the essential functions of the job with or without reasonable accommodation. Dena Calo can be reached at dena.calo@saul.com or 215-972-7104. Jason Ross can be reached jason.ross@saul.com or (202) 295-6655. The post Pennsylvania Medical Marijuana Statute Raises New Questions for Employers appeared first on HR Daily Advisor.